The 35-page dossier alleges the Trump campaign colluded with the Russian government. 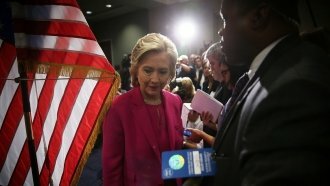 Hillary Clinton's presidential campaign and the Democratic National Committee reportedly helped fund research that resulted in a controversial dossier detailing President Donald Trump's alleged connections to Russia. That's according to The Washington Post, which cited "people familiar with the matter." BuzzFeed News published the 35-page dossier back in January. The report alleges the Russian government had cultivated compromising information on Trump and that Trump's campaign colluded with the Russian government. Trump's repeatedly denied all of the allegations made in the dossier, though U.S. investigators reportedly confirmed some of the details. So here's what we know about the funding of the research: The Washington Post says a lawyer for the Clinton campaign and the DNC, Marc E. Elias, hired research firm Fusion GPS. That firm then reportedly paid former British intelligence agent Christopher Steele. He was the author of the dossier. In a letter, Elias' law firm, Perkins Coie, said it began working with Fusion GPS in April 2016 and that the Clinton campaign and the DNC stopped funding Fusion GPS' research before the presidential election Nov. 8. Perkins Coie said Fusion GPS' research on Trump was initially funded "for one or more other clients." The Washington Post says an "unknown Republican client" paid for research during the primary season. The Senate Judiciary Committee met with Fusion GPS' co-founder Glenn Simpson behind closed doors in August. At the time, Simpson's attorney said his client did not reveal who had paid for the research. According to a statement from the DNC's communications director, the new chairman and leadership were "not involved in any decision-making regarding Fusion GPS." As of Wednesday afternoon, Clinton had yet to release a statement.